You are here: Home / Foot Care Blog / Foot Health & Hygiene / What Do Your Feet Say About You? July 4, 2013 /0 Comments/in Foot Health & Hygiene /by Jenn F.
Most people prefer to just cram their feet into shoes and forget about them. But Jane Sheehan believes that the foot contains many secrets about a person’s mental, emotional and spiritual state. You may have heard of palm readers before, but what about foot readers? Jane Sheehan of Manchester, UK can’t tell the future, but she can tell a lot about your past and present just by looking at your feet. How Does One Become A Foot Reader? The 48-year-old woman has worked in aeronautical engineering and at the Foreign Office before a meeting with a reflexologist changed her life. During the massage, Jane burst out into tears whenever the therapist touched her big toe. 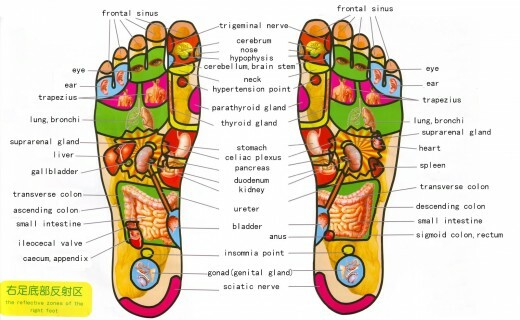 Out of curiosity, she spent a year studying reflexology and learned how the feet connect with the outside world and transmit information to the brain. Jane looks at your right foot to see what’s happened in the past and your left foot to reveal what’s happening now. Larger Second Toe: You have strong natural leadership qualities and should delegate more. Small Pinky Toes: You have a sense of childlike fun. Long Toes: You are creative. High Arches: You are independent and find it hard to accept help. You require more alone time. Flat Feet: You are very sociable and enjoy the support of others. Cracked Heels: There are obstacles you must overcome before moving forward. Long Feet: You want recognition for your good attributes. Square Toes: You speak bluntly and can be very strong-minded and stubborn. Round Toes: You are very diplomatic. Hairy Toes: You are sensitive, but hide it by deflecting. Puffy Soles: You are emerging from a period of exhaustion. Athlete’s Foot: You are irritated by someone who is nagging and hindering your progress. Thick Nails: Someone is trying to interfere or tell you what to do and you’re trying to protect your ideas. Bunions: You do far too much for others and not enough for yourself. She also looks at toenail polish and says we instinctively choose colors that represent what we want more of in our lives — whether it’s compassion (dark pink), lilac (respect), or gold (new challenges). Want To Get Your Feet On The Right Track? All fun aside, we know there are other medical causes for problems like thick toenails (foot fungus) and athlete’s foot. The best thing you can do is wash your feet with antibacterial soap every day, taking special care to dry between the toes. Use an exfoliation cream and pumice stone to gently scrub away dead skin and any minor calluses. Use a moisturizer cream on the edges and soles of your feet. Change your socks when they get wet and opt for a cotton/synthetic blend that is moisture-wicking. Each night, put your shoes inside the SteriShoe UV light shoe sanitizer to kill off 99.9% of the bacteria and fungus living there. If possible, alternate between different pairs of shoes every other day to allow adequate drying time. If you have any sort of condition like athlete’s foot or toenail fungus, be sure to have it treated right away — as these things do not clear up on their own. Visit a podiatrist to help you with painful bunions, hammertoes, recurring blisters, ingrown toenails, or other structural injuries.